If your stat line reads four home runs in four games to start the season, that’s good, right? Well, it doesn’t if that stat line is pitcher John Axford’s stats after his first four appearances in the 2013 season. Axford has lost his closer role after surrendering four home runs and losing two games of the four he pitched in so far this season. Similar to the bump in the road he experienced last season we’ll see if Axford can regain his stuff and become the effective closer that he was in 2011. 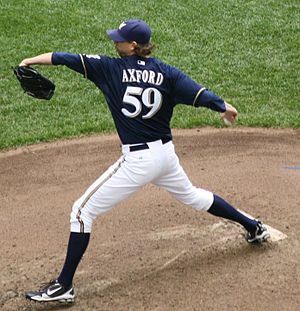 Looking at Axford’s numbers, it got me thinking about home runs given up by pitchers. We all know that Barry Bonds has the most career home runs with 762. But do we know who holds the career mark for most career home runs given up by a pitcher? Jamie Moyer tops that list with 522. He is one of only two pitchers who has given up 500 or more career HR’s. The other? Robin Roberts who allowed 505 four-baggers. Here’s a look at the pitchers who gave up 400 or more homers in their career. Mark Buehrle leads the active pitchers with 302 home runs surrendered. Bartolo Colon follows with 296. Getting back to the Brewers, Jim Slaton holds the franchise record with 192 home runs allowed. He is followed by Bill Wegman (187), Mike Caldwell (161), Ben Sheets (160) and Moose Haas (151). Braden Looper holds the team single-season mark; he surrendered 39 HRs in 2009. While it highly unlikely Axford with jump into the Brewers career list in home runs allowed (he has given up 19 in his career), he is making his way up the ladder on the list of most career HRs allowed by a Brewers pitcher with no starts. As I stated before, Axford has given up 19 home runs. That places his 10th on the list of most HRs allowed by a pitcher with no starts. Vizcaino holds the team mark with 34.